So…Saturday night’s show went really well. I had a blast. There were over 2,000 people there at one point. I played electric guitar for the entire show. We had two electrics, bass, drums, and keys. The other guitarist and I also split up singing lead on the songs. As I mentioned last week, electric guitar is not (yet) in my comfort zone. It’s relatively new territory for me as a performer. This weekend’s show was RISKY for me. We played 14 songs. I’m used to playing smaller sets of four to five songs. 14 is out of my comfort zone. We played outdoors. Again, I’m used to playing indoors. Comfort zone firmly avoided. We played under some pretty awesome lights. I’m used to the lights staying the same. Having them flashing all around was awesome, but it also placed me squarely (you guessed it) out of my comfort zone. You would think that, in an effort to maintain some sense of comfort and confidence, I would choose to just play acoustic guitar and sing. But I didn’t. I went for something out of my comfort zone, because I KNEW it would be good for me. Were there stressful moments? Yep. Would I do it again? Abso-freaking-lutely. Why? Because that show boosted my confidence in my abilities as an electric guitarist. The next time I have to play electric, I’m going to be MORE comfortable, because the memory of how well Saturday’s show went will be in the back of my mind. You’re more confident when you’ve had some successes in the past. It’s that simple. If your goal is to be a rock star guitar player, you’ve got to think and ACT like a rock star. That means you can’t sit in your bedroom and practice guitar riffs all day. You’ve got to get out there and perform in front of people. Otherwise, you’re just a dreamer. It’s the SAME THING if you want to become a “rock star” mix engineer. You can practice mixing the same song over and over again, really perfecting every EQ move…OR you can commit to knocking out a new mix on a regular basis. With every mix you complete, your confidence meter goes up a little bit. When your confidence goes up, good things tend to happen. Your mixes will sound better and better. People will start to assume that you’re good at what you do…all because of confidence. Of course, you’ve got to deliver the goods…but it all starts with YOU, deciding to take action and make it happen. 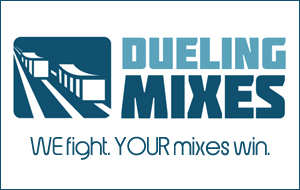 That’s the kind of people we’re looking for over at DuelingMixes.com. If you want to sit back and simply “learn” a lot, this isn’t the place for you. If you’re an action-taker, someone who will confidently accept a new mixing challenge every month, then come on in.